For koicha, have the water temperature hot, and make tea so that there is no foam nor any lumps. So this is straightforward practical information. We can control the temperature of the water if we can control the heating source (charcoal or electricity). We know that the water is the right temperature when we hear matsu kaze or the sound of the wind in the pine. To make tea without foam, the rhythm of the strokes of the chasen must not be too fast, and taking time to knead the tea well (not whisk) should eliminate the lumps. It also helps if the tea powder is sifted before putting it in the chaire. To learn how to make good koicha, you must make it time and again and make a good sense of it. The best way to learn how to make good koicha is to make it many times. The best way to remember how make good koicha is simply to make it frequently. Experience is the key. So okay, making koicha a lot will help you learn how to make good koicha. I suppose if you make koicha a lot, say 100 times, and each time it is different, then you have an experience base of 100 different bowls of koicha to choose what is best. 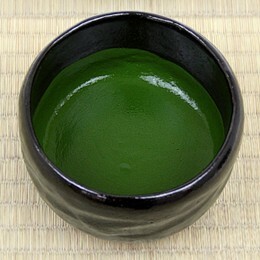 However, if you are not drinking the koicha you are making, how do you know what is the best koicha to choose. It doesn’t help if your guest tells you each and every bowl of koicha you made is good and sufficient either. For koicha, spare the temae and focus on tempering the tea and not letting your breath escape. When making koicha, discard ceremony and pay attention to making good tea and regulate your breathing. In serving koicha, forget the ceremony and keep your attention on making good tea. Do not lose the rhythm of your breathing. When making koicha, discard all notions of temae and procedure. Proceed to prepare the portion straightforwardly, and without any breaks or pauses. This poem is rather unhelpful in making good koicha as well. Making good koicha is a goal, and to do it you don’t have to necessarily follow temae procedure or worry about mistakes, but pay attention to making it good and regulate breathing, without any breaks or pauses. Uh-huh. I want to make good koicha and I am paying attention to my breathing and making it without any breaks or pauses. Guests still tell me it is good and sufficient, but how do I know? One thing I have learned on how to make good koicha, is to drink a lot of koicha. Everyone will have his/her own preference of how they prefer to koicha. You have to drink a lot of koicha to compare how you like your koicha. It also is important to understand where you are in the order of drinking koicha in that the first guest’s tea will be different from the last guest’s tea. Different blends of koicha from the same tea company will taste different, and different tea companies will have a different flavor. Also year to year, like wine, the same named tea will taste different. Sometimes memory, location, humidity and any number of other things will influence how the tea tastes. For example, I had a tea named Hikari when I was in Kyoto, but when I found it and ordered it in the U.S., it didn’t taste anything like I remembered it. Of course you should use higher quality tea to make koicha. Because the flavor of koicha is concentrated, if you use lower quality tea and it is bitter, the flavor of the koicha will be especially bitter. So yes, I have tried to make koicha from lower quality matcha and yes, it is all the more concentrated than if I had made usucha with it. Sometimes, too, the foam from usucha will make it creamier and may disguise bitterness. When making koicha, pour in 80% of the water you need for the first kneading. Make sure all the lumps are gone, then put in the final 20% and quickly mix to the right consistency. So here is some more practical advice. Put in 80% of the water you need the first time around. This will help in making sure you have sufficient water to knead the lumps out of the tea. If you do not have enough water, it will be so thick that it sticks to the chasen and the sides of the bowl and makes it difficult to knead. I know I have not put in enough water, and have developed the dreaded hard ball of tea in the center of the chasen. No matter how much you try to get it out or how much second water you use, it will just stick in there and get harder as you knead the tea. Sometimes it takes more than 100 strokes. I went to an intensive one time and the instructor told us that we should take the time to knead the tea to bring out the true flavor of the koicha. Quite often she said, we hurry through this part of making tea, and the tea doesn’t have time open up. I also have my own theory about taking time to knead the tea well. Sometimes when I drink koicha it has a grainy texture to it. But if the tea is kneaded well it is creamy and silky on the tongue. My theory is that by not taking the time to knead the tea, the dried matcha has not had time to hydrate and so remains grainy. But if it has the time to hydrate, it has a different texture. So a few more tips of my own on making good koicha. You can experiment on your own to see if they are practical for you. Pour enough water in the bowl so that the tea floats. This is practical in that it doesn’t matter if you are making tea for 2 people of 5 people. Put enough water in the bowl so the tea just begins to float before you begin to knead. Some people knead in a parentheses manner ( ) to keep the tea in the bottom of the bowl without it crawling up the sides. Other people knead in a W or M manner back and forth across the bowl. In either case, pay attention to the front of the bowl nearest you because that is where the tea likes to hang out and form lumps. Make sure your rhythm is slow enough so there is no foam. As you knead, it seems like the tea is getting thicker, because it is. The tea is cooling as you knead it. When the tea is getting ready to serve, the texture will change, and the fragrance of it will come up into your face. The texture will start to become smooth and shiny. You can almost feel the difference in the resistance of the chasen as it changes if you are paying attention. And suddenly, you will be able to smell the fragrance of the tea. Now is the time to put the second water in the bowl and mix it quickly to the right consistency. This is practical if you are making tea in a dark room in a black raku bowl and it is hard to see what is going on with the tea. When you lift the chasen to add the second water, look at the consistency of the tea in the bowl, and how much is coating the tines of the chasen. This is your chance to add hot water to warm up the tea again, and to adjust the consistency. If you make koicha to the perfect consistency when you put it out for the shokayku, it is too thick. The tea will cool and get thicker for each subsequent guest until the last guest may not be able to drink it by the time it gets to him/her. Practically speaking, the tea must be thin enough for the last guest to be able to drink it, but not too thin. The first guest will have a hotter, thinner bowl of tea than the last guest. When the bowl returns to you, look at the coating inside the bowl as you bring it in. This is for your own experience and information. If there is no tea sticking to the sides of the bowl, then probably the tea was too thin. If there is a thick pudding of tea left, then it was probably too thick. I like koicha to come back with a coating of tea on the sides that looks like an interesting landscape. I have recently asked students who are making koicha to make enough for one extra guest, and then join the guests to drink their own koicha as the last guest, so that they know what it is like for the last guest to drink their koicha. Some people prefer thicker tea, some thinner. Some students like to be the first to drink, some prefer to be the last. I think these preferences are all good, and it helps to know how your guests like their tea. I hope this helps you make a better bowl of koicha. If you have further tips on making good koicha, please add them in the comments. Thank you for your comment. There is so much here. I appreciate sharing your insights. All of these things come into play in how koicha tastes. I especially want to call attention to your comments on how tea tastes different when someone else makes it for you, and how the atmosphere will influence the taste of tea. The teishu’s pure heart and the love that goes into making each bowl of tea. Thank you again. And if anyone else would like to share their thoughts? I agree with all of this, too, well combined! My favourite method for koicha practise has been making a bowl in the dark, by just feeling, and repeating it (almost) daily. Recognise the weight of tea in the chasen. Surely the importance of water should be remembered as well. Not only the temperature, but the source. How different can the same tea taste depending on the “hardness” / “softness” and minerals of the water! I cannot now distinguish between the water that has been taken from the same spring in the dawn or at noon, but there is an energy difference for sure. And the kettle has its own part. If it is old, do keep the water fresh! If you wish to be sure and you are not familiar with the tea you use, you may want to compare the amount of water/tea and the temperature before serving to the guests. Surprisingly some teas taste better hot (usually high quality) and some (usually reasonably priced) a bit cooler! And some require more water (kambayashi’s genchuu-no-mukashi was famous for this). I’ve (most of us have) noticed that the taste of tea is different when one makes it for oneself and when someone else makes it for you. After all, the atmosphere has a lot to do with the taste. The whole koicha procedure is to prepare you for the tea, thus the temae and teishu’s presence will have their part in the taste. So, the most important could be the pure heart. Breathing. I’m not an expert and these thoughts came to mind and may not bring anything new to the topic, but I just thought to thank you for the useful article. Thank you for reading the blog and taking the time to comment. I am glad you find the content interesting and useful. I will try to continue to provide interesting and useful information. Gotta love this blog which gives a deeper insight in the world of tea ceremony. Please continue showing me more of these wonderful glimpse in this fascinating world. Thank you for your comment. If you have other insights, please share. Thank you for sharing- it is very helpful !